Christmas season is different in Florida. Unlike the rest of the USA where winter means cool to frigid weather, it’s warm, with perfect temperatures that positively demand you hit the outdoors. Many Floridian Christmas festivities take place outdoors and family fun is about beaches, hiking, boating, and barbecues. Florida is all about parades and parties at Christmas that are TALK Miami Beach students don’t want to miss. Don’t miss Zoo Lights at the Miami Zoo every Friday and Saturday of December with extra dates the last week of December. The whole park is lit up with thousands of lights, and all the zoo animals are represented! Every year in December, Vizcaya decorates the museum and gardens in period-accurate holiday decor – that means decor from 100 years ago when the original owner, John Deering, resided there. The evening is set against live music from Vizcaya’s pipe organ, hot chocolate drinks, and desserts. Enjoy this unique event and old world atmosphere! Contact Vizcaya for dates and times. 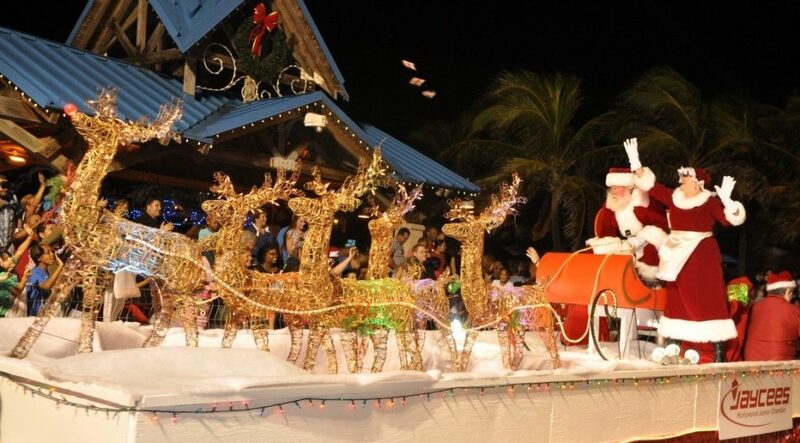 Students will join the throngs of people lined up along the Hollywood Broadwalk to see 63rd annual Hollywood Beach Candy Cane Parade on Saturday, December 8, 2018, at 7pm. The Parade has been running since the 1950’s and features decorated floats both gaudy and gorgeous. The parade participants throw out candy canes to the onlookers. The spectacular boat parade on the Intracoastal Waterway epitomizes Florida at Christmas. Armed with blankets for sitting and baskets with picnic goodies, spectators line the banks of the Intracoastal and cheer as one more spectacular boat than the previous passes by. The boats are lit up with colorful lights and decorations with music piped and revelers singing and cheering on the procession. The TALK students at our South Florida schools really enjoy the Ugly Sweater Competition (wearing winter clothes is somewhat of an occasion in tropical Florida). Of course, they will enjoy a Christmas lunch at the school too. Students have lots of great outdoor activities to look forward to – because this is Florida in the wintertime. Tennis, beach volleyball are two on the calendar – and of course, lots of time to hit the beach.